Until now,the popular way of finding assets within Cumulus has been through the use of text-based attributes. While this method works quite well,it is not nessessarily the best method for every user or every application. eVe 3 Lite for Cumulus 5 is a product that enhances the search process by giving users another option for finding the exact digital asset they desire by enabling the users to search for assets based on visual characteristics. eVe 3 Lite for Cumulus 5 provides a rapid and automatic visual cataloging process that makes assets available for use in seconds. Once the assets are cataloged,they are available for search using their visual content. This visual search feature integrates seamlessly with the existing search facilities of Cumulus 5. Queries are initiated through an easy drag-and-drop interface. Given a query image,eVe 3 Lite for Cumulus 5 returns a set of images that are ranked by relevance to the query image. The results returned can be further refined to find the exact image required. Automatically catalogs image assets Assets are cataloged automatically when they are added to a Cumulus catalog.As soon as they are added to the catalog,they are available for use.You no longer have to depend just on text tagging of images .It augments your existing tagging scheme or works without one. Simple drag-and-drop interface to initiate visual search Finding an image in the Cumulus catalog is now even easier than before. Searching is as simple as dragging the query image on to a search window and clicking a button.eVe 3 Lite for Cumulus 5 takes care of the rest. Fast indexed retrievals Because the visual signatures of all images are indexed,searches are lighting fast.It takes a few seconds to get your results whether your catalog has 20,000,or 200,000 images. Results displayed in relevance order eVe 3 Lite for Cumulus 5 always presents the results in a ranked order. 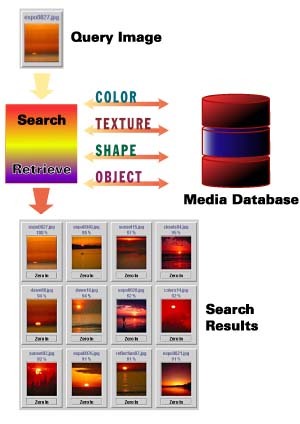 It knows which assets match the query result closely and displays them in that order. For those who need more comprehensive visual search capabilities, eVe 3 and eVe 3 Professional are available from eVision. Both products provide more advanced analysis and search options. 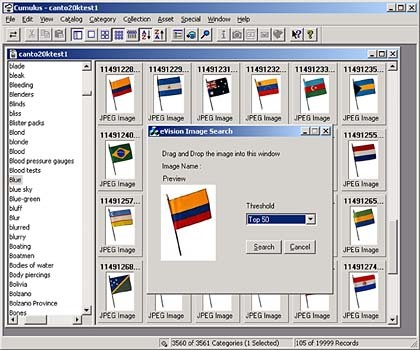 Visual Vocabulary and Visual Meta-Tagging are additional features of eVe 3 Professional. For additional product information contact eVision: bizdev@evisionglobal.com.